Our self-reinforcing tradition of dinner after our meeting is solidifying. We hope to improve our planning, so fewer people will miss the dinner because they couldn't find the restaurant, and perhaps so that we can choose some requiring reservations. Note that each red heading is a link to the relevant website. An old standby, 4.9 miles SW of Kepler's. 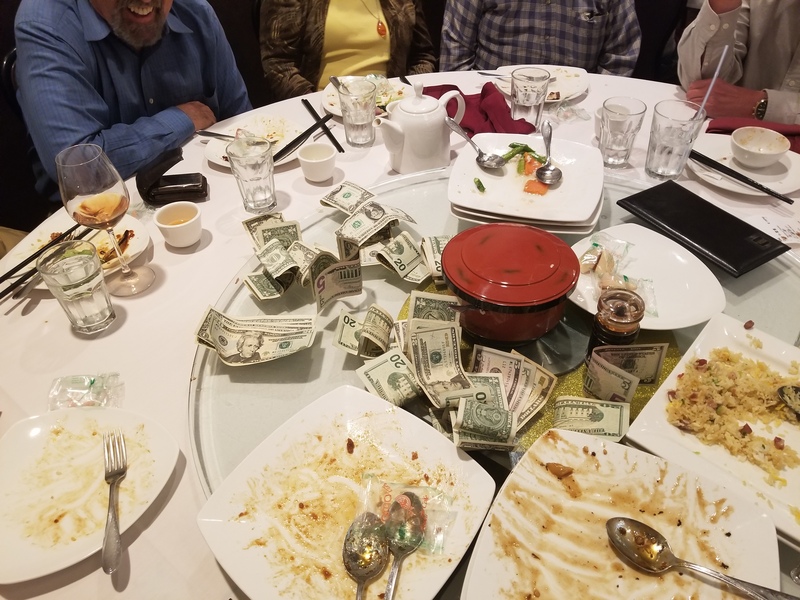 The photo of paying the bill was not staged! But they are closing their doors in September 2019. A little higher on the price scale. Parking can be a challenge. We had one of our celebrations here, and it was very well received. They seem to be vegetarian now, though some say the buffet has two meat items (chicken). This would be a good location for our meeting as well. We can likely arrange to be served in a back room, mostly to ourselves. Freeway access is easier than Le Boulanger, and the Cupertino location is just as close to the north bay. This is my preference (Frank Nemec). They close at 9pm. I don't think I've been to this location, so I don't know how suitable it would be for a Saturday afternoon/evening. I suspect it will be too busy. Good location, fairly comparable to Le Boulanger, but not as much indoor seating. I don't remember if the seating is conducive to a group like ours.